The Dan Moi is the traditional jew's harp of the Vietnamese mountain people Hmong. Hand-made by a small number of excellent local craftsmen, this brass instrument captivates even novices by being easily playable and having a brilliant sound, rich in overtones. Playing the Dan Moi is effortless and enjoyable. In contrast to other types of jew's harps, the Dan Moi must not be pressed against one's teeth to produce its full and warm sound. Rather, the instrument is gently rested against the player's lips with one hand while the other plucks the tip of the reed softly. Moreover, the Dan Moi affords players with an almost unlimited range of possibilities for the creation of sound effects, since mouth and tongue are given considerably more freedom than with other types of jew's harps. For example, you may try a simple echo effect by temporarily and rhythmically removing the Dan Moi from your lips, or try a tremolo by moving the tip of your tongue inside your mouth while playing. 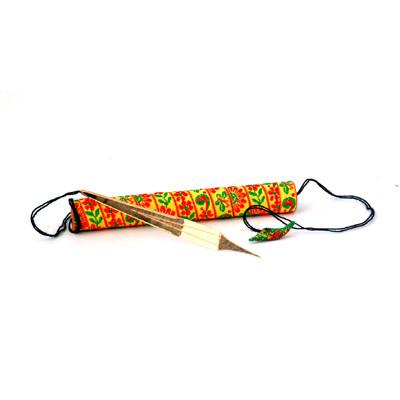 Each Dan Moi is hand crafted in brass and comes in an unusual fabric covered wooden tube. A unique present for the musician who has everything! Larger and lower in note than the basic Dan Moi. Length: 12 cm.